“... two chess tables, with full sets, and two draughts boards and men." (CITY COUNCIL., New Zealand Herald, Volume XXIV, Issue 7947, 13 May 1887). The chessmen are long gone but one chess table survives after 131 years, along with one of the draughts boards now inset into a twentieth century table. The Auckland Library Heritage Trust recognised the significance of the furniture in the history of Auckland Libraries. Chair Colin Davis notes that the original chess table is significant as part of the collection, “these items are realia which reflect the history of the library”. “The tables are very chaste, and designed to show our beautiful ornamental timber to visitors to our city. On the edge is engraved, ‘Presented by the New Zealand Insurance Company, 1887’”. (Auckland Star, Volume XVIII, Issue 95, 23 April 1887). Photograph by Dr William Cottrell. Once installed in the library the tables were in high demand. And thanks to Papers Past, the website for digitised content, we can go back in time to the newspaper reports of the day. We have images of the Lower Reading Room, now a wing of the Auckland Art Gallery | Toi o Tāmaki. Image: New Zealand Graphic. 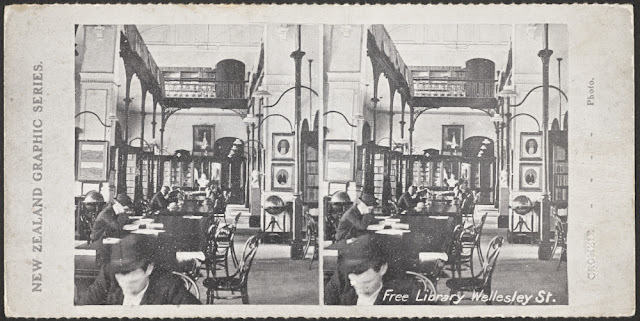 Stereoscopic card showing the interior to the old Auckland Public Library showing people reading at tables, early 1900s. Auckland Libraries Heritage Images, 880-348. 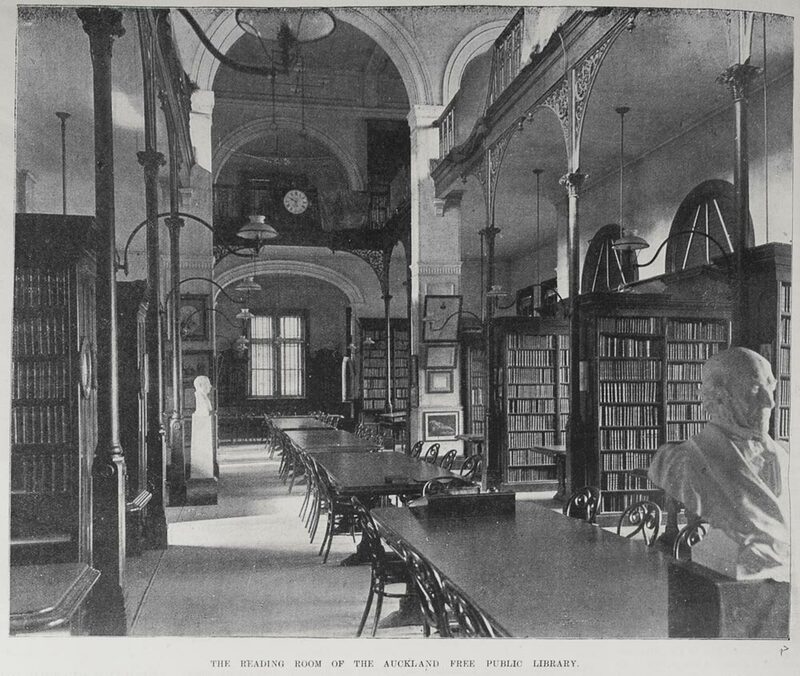 The Free Public Library, like the nineteenth century mechanics institutes, were places for mostly men, to read newspapers and books and to play chess. 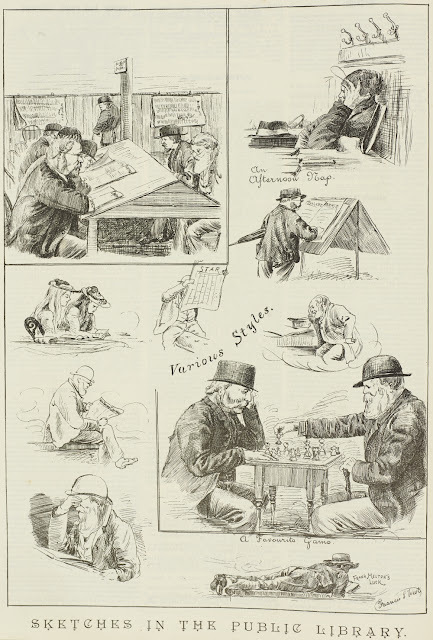 The cartoon by Francis S. West for the New Zealand Graphic (7 May 1892) ‘Sketches in the Public Library’ depicts the library as man cave featuring the chess table at work, ‘A Favourite Game’ as well as ‘An Afternoon Nap’. Newspapers and chess are still present in the modern library but more often on a screen. And we are not a male-dominated place but open to all. Image: Francis West. Sketches in the Public Library. From: New Zealand Graphic, 7 May 1892. Auckland Libraries Heritage Collections, NZG-18920507-482-1. It's understandable that the chessmen didn’t survive, but the chess table is now a feature in the Reading Room in the Central City Library where the library presented by Sir George Grey continues to be enjoyed and researched. 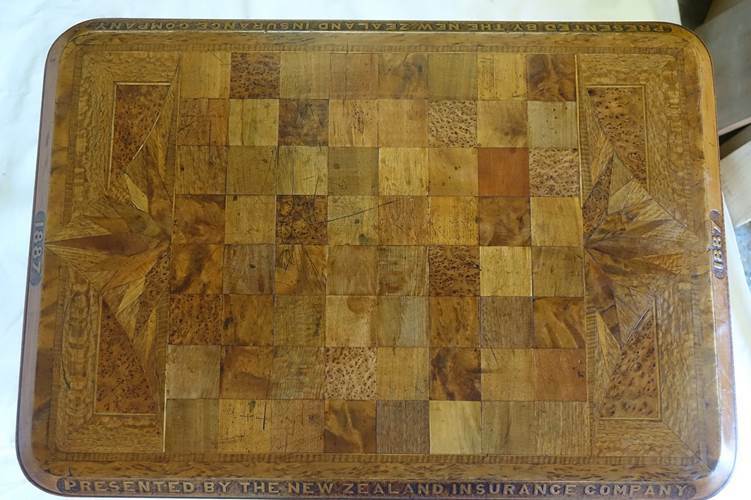 The twentieth century rimu desk with draughts board set-in has a new role as the information table beside the ‘Real Gold Case’ which features highlights from the collections in the Reading Room. Image: Inset draughts board. Photograph by Dr William Cottrell. The Auckland Library Heritage Trust, founded in 1991 to support the heritage collections, commissioned the New Zealand furniture expert Dr William Cottrell to treat the surviving tables. This is not a full restoration but rather a sensitive rescue treatment, which involved replacing 25% of the inlay on the surviving chess table. Dr Cottrell is the author of Furniture of the New Zealand colonial era: an illustrated history, 1830-1900. 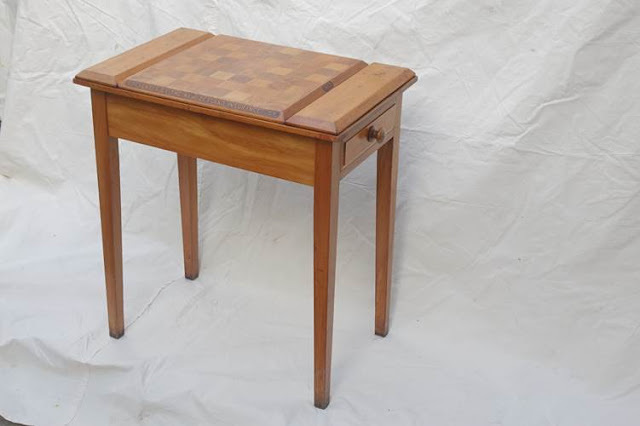 It is rare to know the name of the cabinet maker, William Norrie (whose workshop was nearby in Shortland Street), and the working life history of a New Zealand table going back to 1887. Visit the tables when you next come in to the Reading Room and exhibitions in the Gallery on Level 2 on Lorne Street. You can help towards the cost of this expert care and attention with a donation to the Auckland Library Heritage Trust. Donations can also assist with developing the collections, from photographs to rare books, oral histories, manuscripts and maps, as well as supporting the preservation of Sir George Grey’s bequest to Auckland. Image: Auckland Weekly News. Reading Room with a chess table on the far left, 22 August 1901, Auckland Libraries Heritage Collections, AWNS-19010822-10-1.